As I was readying to leave the house this morning, I spotted a book, a copy of The Little Prince. Some members of our family recently saw a play based on the book, and one of them must be reading the text for fun. It is from a high school classmate’s mother. Her son, David Miller, was unique. Incredibly smart and a gentle soul with a sense for fun. He had bleached blonde and spiky hair, like Billy Idol. For some reason, I still remember his cursive handwriting: lots of loopy letters, a bit sloppy, but written with a confident hand. He was co-editor of the school yearbook. Our school had a literary journal and his writing pieces were often featured. I think I am a decent writer, but David’s prose was a great deal more lyrical and insightful. He was much admired and well-liked. Every young lady seemed to have a crush on him. David was unfailingly polite and funny with all classmates, which was hard to do given the social cliques that fissured a very large grade. In our senior year, David was driving some friends down a windy road on a slick road. The car skidded and hit a tree. Everyone else was ok, but David was badly hurt. He faded into a coma. 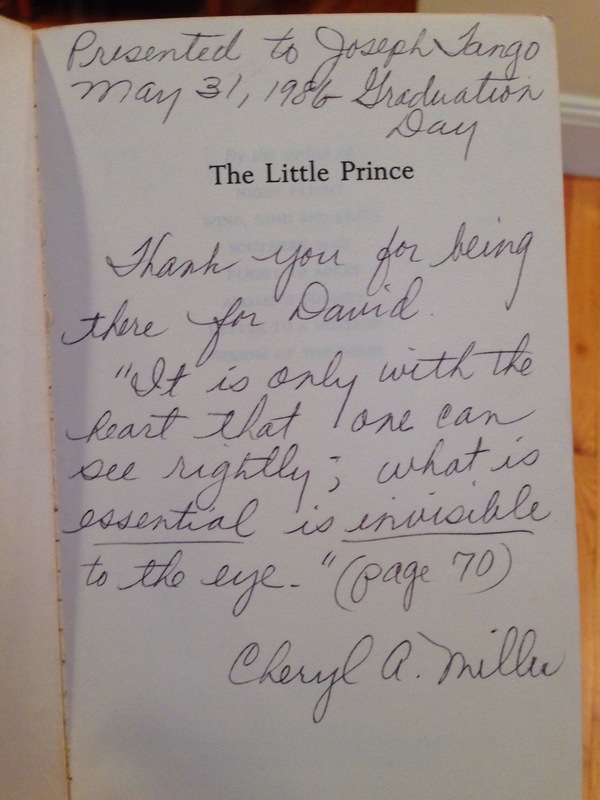 Many of us wrote heartfelt notes to David, which his mother read out loud to him. His mother, a single parent, had to make the hard decision to remove life support from her only child. I will never forget the time in AP U.S. History, when the school principal interrupted classes to announce to the school over the PA that David had died. Every few years, I think of David. I remember how strong his mother was amidst all the uncertainty. A few of us in his class even just recently referenced him in a Facebook message thread. David was a great individual, and I have many good memories of him. I have tried to track down Cheryl A. Miller. If anyone can help me, I’d greatly appreciate it. I just wanted to say hello to her and to wish to her my best.